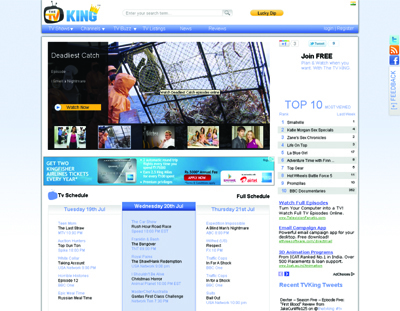 TheTVKing provides users access to thousands of links to watch their favourite TV episodes online legally. TheTVKing aggregates links from websites such as Hulu and BBC iPlayer and in 7 countries including: UK, USA, Canada, New Zealand, Australia, France and Germany. At TheTVKing we also have a group of writers who provide, TV news and episode reviews. Unlike sites such as Clicker and Sidereel, TheTVKing doesn’t solely focus on the US market. Providing links for users in 7 countries including: UK, USA, Canada, New Zealand, Australia, France and Germany. Being based in the UK can provide a different perspective to the online TV links.